Usually I will do my own hair treatment at home but this time I think my hair need more attention and pampering. Here for the 4 Steps K-Pak Hair Repair treatment by Joico to replenish hair moisture and bring back the shining healthy hair at the same time strengthen the hair. Basically there are 4 steps in this treatment and it takes about 1 hour to complete. It started with shampoo, sealer, deconstructor and lastly is the hydrator treatment. For step 1 the K-Pak Clarifying Shampoo is an intense cleansing or clarifying shampoo that is able to remove all the access deposits, impurities and styling residues. Then followed by step 2 using K-Pak Cuticle Sealer a type of clear thick liquid, apply on hair and leave it for 5 minutes then rinsed. It helps to smoothen, tighten the cuticle, locks in curls and colors. After that we moved on to step 3, using K-Pak Deep Penetrating Deconstructor, a cream type that smells like banana. Apply on hair and leave it for 5 minutes then rinsed. Hair reconstruct by rebuilding the hair structure from inside out. And finally the last step which is K-Pak Intense Hydrator, after applying the cream all over the hair then steam for 10 minutes and rinsed. It replenished moisture and lipids to dry and damaged hair rendering manageable soft shinny and hydrated. Sealed cuticles and improve elasticity too. Immediately after the treatment, my hair felt so light and fluffy. Then Winson trimmed off the dry and split ends so now my hair looks shinny and healthy. Well, he also recommended me to try the popular Korean Gel Perm. This is a trend and every month he has many customers coming for this perm. I decided to jump on the band wagon and do it. The whole process of the Korean Gel Perm takes about 1 and half hour including blow dry. It’s quite fast right. What I really like about this this Korean Gel Perm is the finishing looks so natural. I did the medium curls and it looks so natural, soft and bouncy. Another reason why I love it is because it is easy to maintain. So now I don’t have to straighten or curl my hair before going out. All I need to do is after washing my hair I just blow dry and use my fingers to twirl or curl it. It’s simple, fast and hassle free. But the curls can last about 3 to 4 months, anyway I still think it’s worth it. Overall I am satisfied with my hair treatment and perm. Thanks to Winson for recommending me to do the Korean Gel Perm. If you girls want to have the soft natural curls and don’t have time to DIY you can go for the Korean Gel Perm at Winson Kow Hairtistic. They have won several hair awards and competition too. Nothing can beat the feeling of walking out from the hair salon feel confident and gorgeous. Always have my hair wash at the barber that I have been frequenting for almost 10 years now. I love your hair and they are looking so full of life and hydrated. Nice hair after the treatment and it look healthy. You looks great here! K-Pak hair repair treatment seems to have straightening effect? LOL. Btw, I love that Gel Perm! that looks really nice!! 3 -4 months is not bad. I also tried a treatment lately and it also quite good. Reminds me that I need to do my hair treatment too. Should try this instead. You should try more different style next time! Looks so pretty, this length of hair make you look younger!! wow can see the difference before and after the repair treatment! will definitely recommend this to my friends!! Beautiful hair and perm. My hair needs pampering as well. 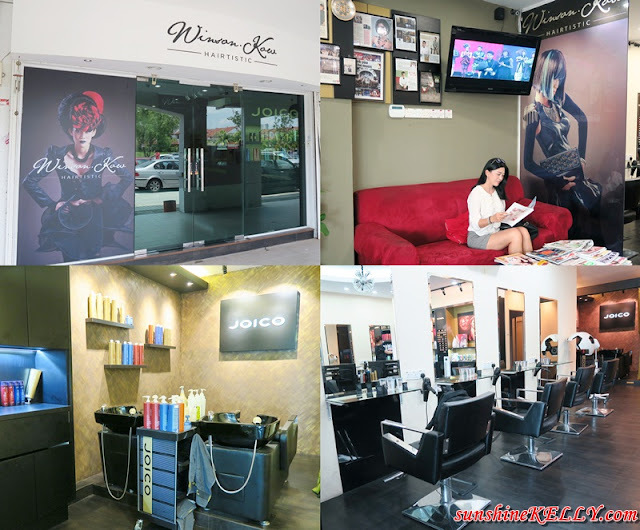 Will see which salon in Ipoh offers Korean gel perm. your hair look healthy and smooth after the treatment! I love korea perm, but too bad my hair so short!! I am quite curious about Korean perm! Next time would try it. First time hearing Winson Kow Hairtistic. love their hairdo for you! The curl looks nice on you! I did K-perm before, and love that so much! The perm looked very natural. Your hair looks smoother than ever after the perm. Now im tempted to head there for a hair treatment.